Welcome back to Survivor Reborn, for an extremely exciting article. Remember those days when we use to revel in Tomb Raider’s atmosphere? When we used to have to explore and figure out what to do? Those intricate levels with a mixture of puzzles, switches, and keys? Ledges that didn’t glow? Surprise encounters with animal enemies, hidden tropical wonders, shiny secrets, and lethal traps that frequently resulted in Lara meeting a grizzly end? I write this with a grin on my face, because the time to reminisce is over: Tomb Raider is back, and it’s back in big way. I’m not talking about Shadow of the Tomb Raider. I’m talking about Nicobass’s Dagger of Xian remake. Yes, the demo is finally available! We here at Survivor Reborn have been lucky enough to play the demo of Nico’s ongoing magnum-opus a short while before release, and we can’t stop thinking about it. The pictures and clips everyone has seen so far have been impressive, but the demo blows them all out of the water. You won’t believe how polished it really is. Every corner, every little nook and cranny is filled to the brim with details that bring this enormous demo to life. From the wind blowing through the leaves and the drops of water trickling from wet rocks to the way the light plays with reflections in Lara’s glasses. The visuals are nothing short of jaw-dropping. The ambient audio dragged me further into the experience. The dripping water and eerie howling wind built up the total feeling of isolation and atmosphere necessary for a true Tomb Raider experience. Aside from grunts and screams, Lara is silent. She doesn’t talk to herself. She’s your avatar as you explore this lush world – you’ll find it’s you asking out loud ‘How the hell do I get over there?’ rather than Lara asking that question out loud. Then there’s the music. Dean Kopri has done a stellar job in recreating some of Nathan McCree’s spine-tingling themes, and adding some new ones to the mix; each one fits the theme and environments perfectly. No aspect of this game has been done to a sub par level; everything has been produced to an immensely high standard. Jennifer Milward lends her voice acting skills to Lara, and can be found as the voice of the journal (in the ring inventory), to offer hints if the player gets stuck. You’ll recall this is a similar feature to the journal found in Anniversary, but don’t worry – you won’t be finding anything about Lara’s father in this one. The load screens have been lovingly crafted by the supremely talented Inna Vjuzhanina, who for this demo has provided us with a stunningly beautiful piece of artwork depicting the Great Wall, so rich in colour and depth that you could quite happily step through your screen and straight into the fantastic landscape. I love that Tomb Raider 2 has been given the true remake treatment. Much like the wonderful Resident Evil remake that first appeared on Gamecube, this game treats its source material with total respect. Those areas you remember? They’re still there. They’re bigger, prettier, more immersive than ever before, and accompanied by new areas that fit so perfectly into this world that you’ll find yourself questioning if they were in fact in the original. The gameplay is pure classic Tomb Raider. Hunt for keys and switches in order to progress, along with some glorious platforming. I was ecstatic to see that white ledges showing the player where to go are a thing of the past! These new environments are lush and alive, overgrown after centuries of growing undisturbed in the wild. The paths aren’t immediately obvious and actually take some exploration, plus trial and error. I often accidentally (okay, sometimes deliberately) threw Lara to her demise, and if you were a fan of doing that in the classics then you’ll be delighted to know that that particular avenue of fun has been reopened: full crunchy, cringy, nasty, ragdollish deaths are back. It’s a gruesome sight, and it happened quite a lot while I was playing. Numerous traps forced me to be patient and incredibly careful in my traversal – yet this level of interaction only served to make the gameplay even more rewarding. A few times I actually found myself stuck (yes, stuck on a Tomb Raider game! It’s been so long! ), and had to try different paths and routes to get to where I wanted to go. Its gameplay truly took me back to the glory days of Tomb Raider; the environments are intriguing, exploration is rewarded, and you’re not shooting at hoards of militia every other minute. Options for customising the HUD is greatly welcome – I had it as close to the classics as I could. No target reticules for combat, no hand icon for picking up items. They’re basically little options that really cement the player in the environment and take away those little ‘I’m playing a computer game’ feelings that might otherwise be present. Nicobass’s Dagger of Xian holds up perfectly, not only against the original but also in the modern era of gaming. It stands out as one of the truest, most enjoyable Tomb Raider gaming experiences in years. Lara is Lara: this isn’t a game about her personal struggle, or family drama, or missing friends. This is a game about the puzzles, the environment; it’s about exploring the unknown, and not having to stealthily fight off militia wherever you turn. Every inch of this demo screams professionalism. Every minuscule detail shows off how much effort has been lovingly poured into this project – from the main menu right through to the ‘To Be Continued’ final moment. It’s an incredibly polished gaming experience that the Tomb Raider community is going to go absolutely wild for, and will (should!) no doubt attract the attention of large gaming news websites. The biggest compliment I can pay this demo is that I forgot I was playing a fan-made game. Not a single moment of this felt like I was playing an amateur fan level. Gaming companies should be clawing to get hold of Nico’s skills. If we’re lucky – and the developers of Lara’s adventures actually have their heads screwed on – then they’ll hire Nico to help develop the series. The demo is just so utterly well crafted that it completely drew me in. It’s beautiful and immersive. Sometimes relaxing, sometimes challenging. It’s exciting, and a true labour of love. 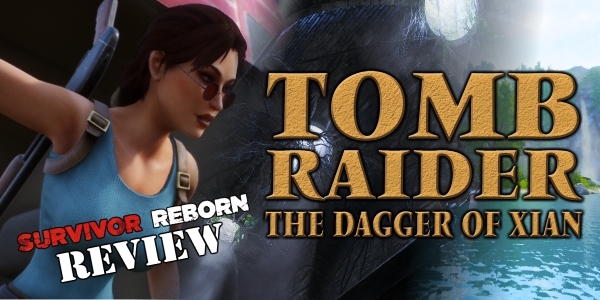 Review: Nicobass’s Tomb Raider 2 Remake Demo by Chris Jones (author), and J. R. Milward (editor) of Survivor Reborn is licensed under a Creative Commons Attribution-NonCommercial-NoDerivatives 4.0 International License. I agree with mostly everything Chris has stated. Nicobass integrates the exact same gameplay from Crystal Dynamics’ TR Anniversary and even Underworld. That’s REALLY impressive, but problematic as well. This has nothing to do with Nicobass, as the Anniversary/Underworld gameplay mechanics created by Crystal Dynamics are at fault here. Nicobass addresses some of those issues like no glowing ledges, no grapples, no hints, etc. However, issues like invisible walls around unclimbable surfaces that probably should be climbable (I mean why not) and combat still persist. I never say combat as an improvement in Anniversary or Underworld. Call me an old-fart, but I much prefer tumbling and shooting tigers in the original games. I found the combat in this demo kind of awkward—but then again it’s been a while since I’ve played Anniversary, Legend, and Underworld. Still, I always did prefer the combat system in TR1-5 over L-A-U. Visually the demo is spectacular! Nicobass doesn’t disappoint at all. The cinematics and animations are superb. Jennifer’s voice is lovely. This demo delivers don’t get me wrong. The demo was really reminiscent of TR Anniversary by Crystal Dynamics. I was surprised I was playing a fan game—it just felt so official! I know that utilizing the modern TR control schemes (post 2006) is the way to go now, but I’d a wee bit more interested in something more akin to Free Runners or Core’s cancelled TR Anniversary (that we never got to play). Regardless, Nicobass has done an amazing job and has my interest. Can’t wait to see Venice! Indeed, the demo is visually spectacular, but as for the rest what I basically saw was like a Crystal remake of TR2 – and don’t get me wrong, that was just what I’ve expected – the thing is, I don’t like Crystal controls. Of course, no shining ledges and mecanism, items well hidden, beautiful concept art… but Crystal controls. Not a classic gameplay, as the article states. I’m not so fond of the little textes find next to every skeleton. I liked the isolation and absence of information in the original one. This trait of finding info every know and then might be nice, but it’s a detail taken from Uncharted, it’s not Tomb Raider style. After the third text you get tired and don’t even read anymore. I think it’s not necessary. As for the rest, we’re grateful all those Crystal traits like family issues or constant talking are not there, but c’mon, it weren’t expected anyway. I enjoyed so much the demo but I am not enthusiastic over the controls and the gameplay in general. There were barely booby traps, and some added and expanded areas were ok, but you might be expecting something closer to the original. All in all it was a beautiful experiencie, but it’s like a Crystal remake in the end, something far more close to Anniversary than to the Classic TR2. But don’t mind me, I was never into remakes. I wish fandom bid more for remasters than for remakes. A remake will never beat the classic, and in my case, pretty graphics won’t do it all.